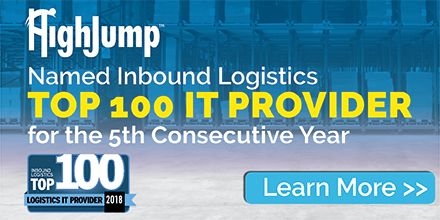 HighJump has again been appointed to Inbound Logistics’ 2018 Top 100 Logistics IT Providers. This year’s win is a result of HighJump’s solutions and services enabling supply chain professionals to revolutionize workflows with the automated and connected supply chain of tomorrow. It’s the era of the new consumer. Supply chain professionals need solutions to handle new business models, stressed traditional logistics systems and deconsolidating networks resulting from reverse logistics, same-day delivery, mobility, social engagement and beyond. To attract top talent, businesses must also provide the tools the next-generation workforce expects. HighJump makes this possible. Every year, Inbound Logistics editors recognize 100 logistics IT companies that support and enable logistics excellence. Drawn from a pool of more than 300 companies, using questionnaires, personal interviews, and other research, Inbound Logistics selects the Top 100 Logistics IT Providers who are leading the way in 2018. Editors seek to match readers' fast-changing needs to the capabilities of those companies selected. All companies selected reflect leadership by answering Inbound Logistics readers' needs for scalability, simplicity, fast ROI, and ease of implementation. The Top 100 list appeared in the April issue of Inbound logistics, available here.